I want to remind you that there are benefits and drawbacks to every type of axle and that most types of axles work pretty well. The major differences are issues of performance vs convenience and in the grand scheme of things we all have to deal with, these are small differences. Surly has always done our best to make good bikes that are fun to ride, can take a beating, and are cheap enough that the people we love can afford to ride them. We design our bikes to work for you instead of the other way around, and a lot of that means being able to use the parts you love. Some of our recent trail bikes work great with thru-axles and we give you the option to build them that way. 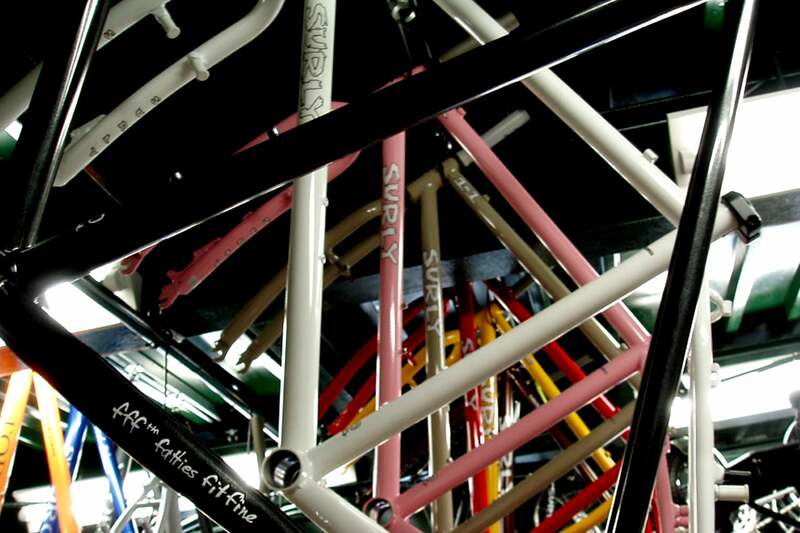 If you are currently using or considering one of our thru-axle compatible frames, you should know that those frames are designed for and ship with Surly bolted thru axles. How are these different from Maxles and other more common thru axles and why did we do this? First off – our axles are a bolted design which require an allen key to use and have a loose bolt and washer which may or may not be ideal for you. 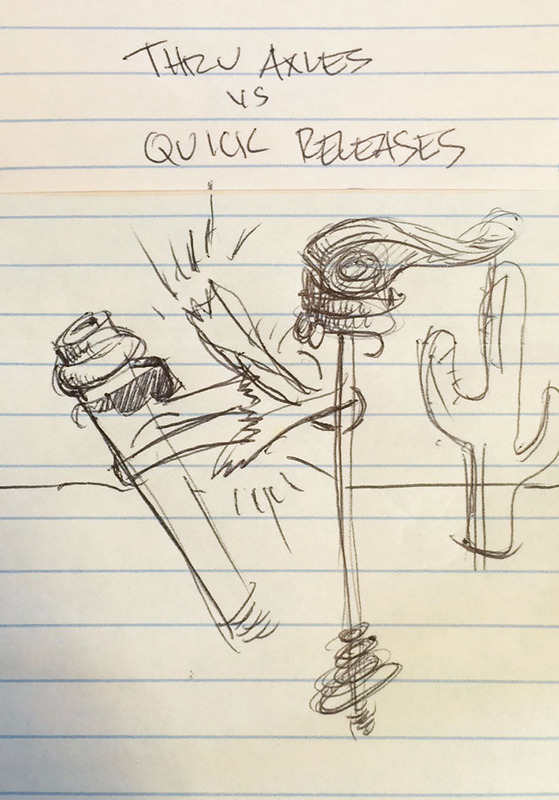 If you grew up with quick release axles, you might get rich filling your swear jar because of this extra hassle. But! Some of us grew up bolting our wheels to bmx bikes, and our go karts, dirt bikes, and dune buggies so a bolted axle feels like home. You should know that I am in that camp and the QR axle is like a friend’s pet monkey to me - I don’t really like it or trust it, but can live with it if I have to. Our axles are much cheaper and a little lighter than standard tool-free thru axles. You might not agree with every part spec’d on our complete bikes, but unlike the bedazzled bartender mixing your drinks, our product managers have the hard job of making our cocktails delicious AND competitive with several other mouth-watering options available to purchase NOW on every cell phone made during the last decade. IE – The money we save by using bolted axles gets put into other parts on the bike. Having to carry an allen key in my pocket is worth it for a clutch derailleur to me, and you might agree with that. Our axles use common metric hardware and are easy to repair. Good luck finding a 12x1 nut or die in Kathmandu. Our axles work with horizontal dropouts. 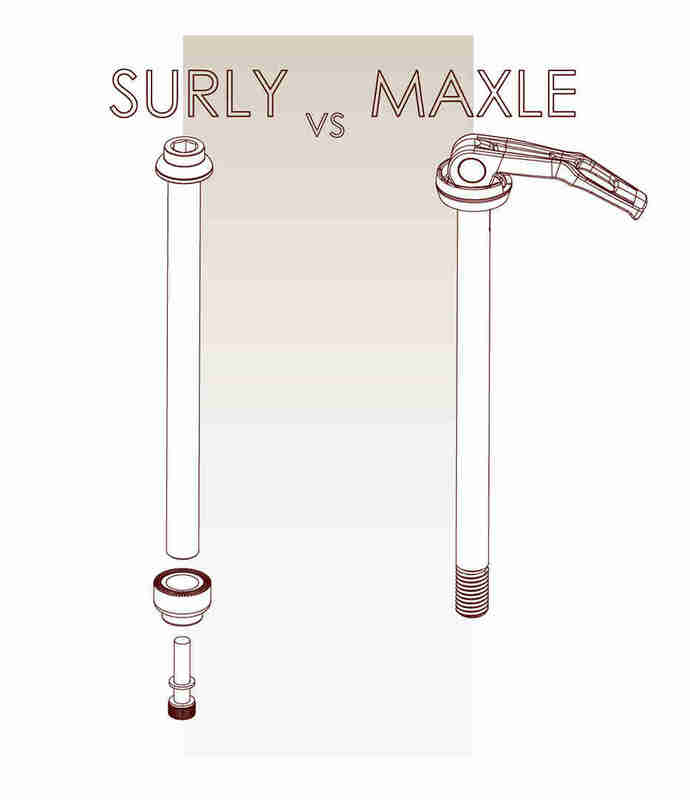 Surly might be the only company offering 12mm horizontal dropouts right now. We think thru axles and single speeds are as good together as cheap beer and tailgates. You might feel the same. Our bolted axles allow for use of a chain tensioner/trailer without compromising axle stack or thread engagement. Our axles require a thief to use a tool to steal your wheels. That is time and energy they might not be willing to spend. Most importantly our axles shut up and work. In a world full of noise, that kind of silence can be a real godsend.